Wat Thung Khee Seur Muu 5, Ban Rimkhung, Tambol Chom Phu, Saraphi district, Chiang Mai, 50140 Area 500 square meters. History The temple was built in Vieng Khum Kham period. That was 700 years ago. It was built by Phya Mangrai Maharaj as a province. The front of the temple faced Kuang river. It was named as Wat Thung Khee Seur. According to the local people’s words, the temple area was a habitat of tigers and there were lots of tiger’s stools found. Many years later Wat Thung Khee Seur encountered a flood because of the change of river direction. The temple was damaged by the river. The temple was abandoned for more than 600 years. The ruin that was left to now is the pagoda. In 2005 venerable monk Wicien Supalo came to stay overnight at Wat Thung Khee Seur. At that time the temple was left old with no renovation. Later Thung Khee Seur villager’s leader Mrs. Sriphan Pimpa and Mr. Sumpaul helped renovate the temple. There was a finding of Buddha relics under 2 meter deep ground. It is now a respectful object for visitors since 2009. Again the villagers of Thung Khee Seur invited venerable monk Apiwat Kantasilo from Wea Ru Wan Temple; Tambol Yangnerng, Saraphee district, Chiang Mai, to renovate the temple. 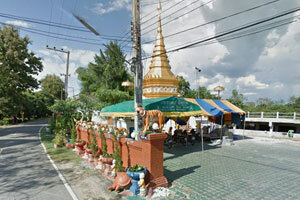 In 2010 the temple was registered as a good temple under the National Buddhist Organization. The current temple condition: It was registered as temple in 2010. Interesting places in the temple: Fortune telling service. Selling blessed candles for kindness, business, personal charm, real estate business, naughty child, husband and wife problem, debt . Spirit house of Phaya Seur. Passing through pagoda of Buddha relics.